As Harry enters his sixth year of school at Hogwarts, he is already faced with a bunch of problems. Voldemort has returned to his full power and is out to finish what he started. Wizards and witches are disappearing and dying every day. Harry and his friends search the obituaries looking for familiar names and hoping for the best. 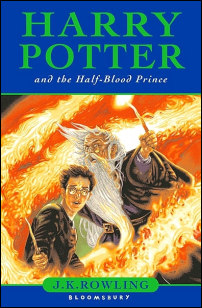 Harry struggles to learn more about the Dark Lord, with the help of Hogwarts Headmaster Albus Dumbledore, to find You-Know-Who's vulnerability. But Harry's life isn't all about the war. School goes on, friendships become stronger, and Quidditch matches help release extra energy and stress. Sixth year students learn how to Apparate. Throughout the learning process, some students may lose some eyebrows. Hermione Granger, as usual, is on top of everything. Ron, of course, is behind. Romance blooms and couples form. But with all this excitement comes a tragic end to an unexpected character. J.K Rowling has outdone herself once again. Her talent captivates the reader and makes him or her want more. Her style never gets old. She reveals small pieces of information that open up many more doors to explore. Jo never lets her readers down. Overall, this fantasy novel receives 5 stars. The action, romance, and fantasy really make the reader think twice. New worlds and new ideas can be discovered. Your life may be changed as mine has been. Harry Potter and the Half Blood Prince is definitely HOT, HOT, HOT! !